I cannot wait until the waka ama nationals start in the weekend in Cambridge. If you don't no what waka ama is here is a little idea. Waka ama is where there is six people in one waka or boat that you paddle in. But there is always a tricky part you HAVE TO stay in time with the person in front of you. But if your in the number one seat it is always different you must keep to the same rhythm so that your fellow paddlers can keep in time. In our team there are six boys that have very special places like Taimana he is the person that turns us around and keeps us going straight in races, then theres Jordan and Stevenson who are the wheels, and finally there's Collin, Mateo,and I are the engines that push the waka and makes it go faster than ever. We are in the intermediate section which are people under the age of 13 years to 11 years old's. We would also be one of the youngest teams representing our club, because we are under the age of 10 years old. We have two teams in the intermediates that get coached by the same person. The other intermediate team is Levi, Anthony, Auri, Frankie, Uili, and Isara, and managed by Mrs.Samuels. In nationals there are over 300 teams competing for that number one place. 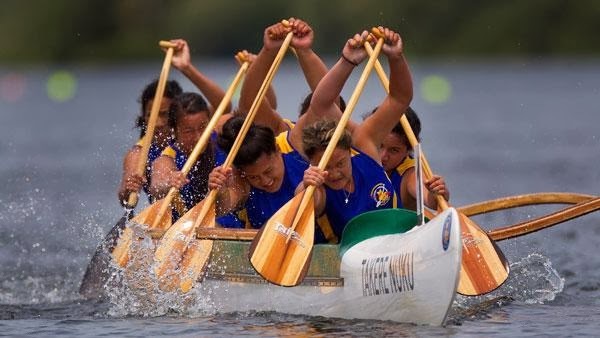 We are one of six teams representing Tamaki Outrigger Canoe club, 11 out of 12 people that paddle also attend Pt England school. We have been training for the last 3 months for this event which is the first time we have been in nationals. We are racing for the next 2 days, the first race is on Tuesday which is 500 meters long with 6 paddlers, and then we combine with the other intermediate team which paddles 1000 meters. We hope to do the best we can and that we succeed. It's finally here the New year of 2014 I could not wait to go to the beach and have an amazing time with my family. Once arriving in the scorching Okahu bay approximately 2pm in the afternoon. My parents set up for the night to wait for the fireworks that would explode from the side of Sky city into the dark night. I could not help but notice the deep blue water, where I played with my cousin Lishana. I had a magical time playing play fights and relaxing on the water, looking at the clear blue sky where the clouds hovered above us. It was drawing nearer to the evening and I couldn't figure out what I was going to do. I was so excited I could not relax , there was so much to do. The first thing I wanted to do was play touch on the soft sand with my mum, and my cousins Lishana and Kingston. It was a great game my cousins and I had so much fun. After the best game of touch it was finally dinner time. I had a delicious dinner which was scrumptious chicken and tender stuffing it was yummy. With the dark sky coming closer I could tell it was time to play with my super nerf ball that glows at night with my amazing glasses, my cousin and I played almost the entire night it was super amazing. It was about 11.54 and all I could hear was "wake up Louis the fireworks are starting" said my Nan "what I can't believe I was asleep". After a while of waiting we got to see the amazing fireworks. I could not believe my eyes there are amazing colors like yellow,red, green, and blue. But hopefully next years fireworks would be a little better.